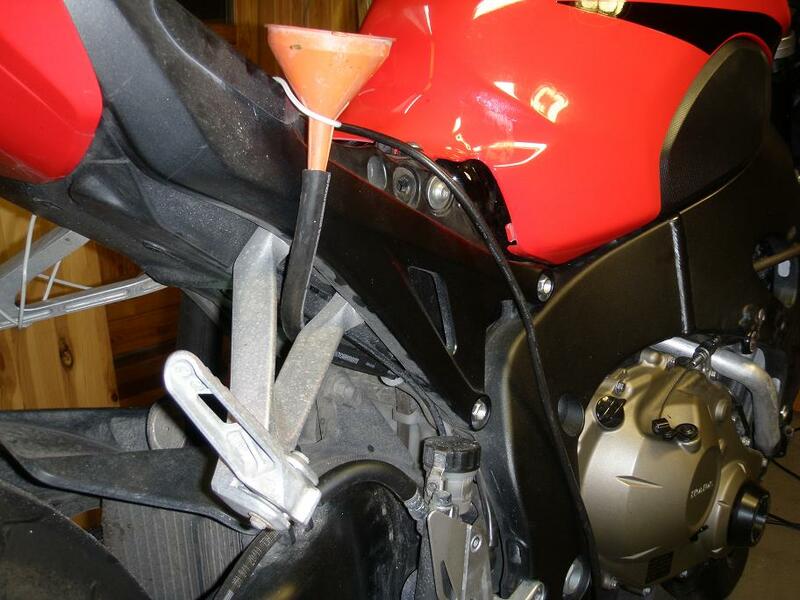 This Do It Yourself (DIY) article describes how to remove and reinstall the radiator on a 2008 CBR1000RR Honda Fireblade motorcycle. 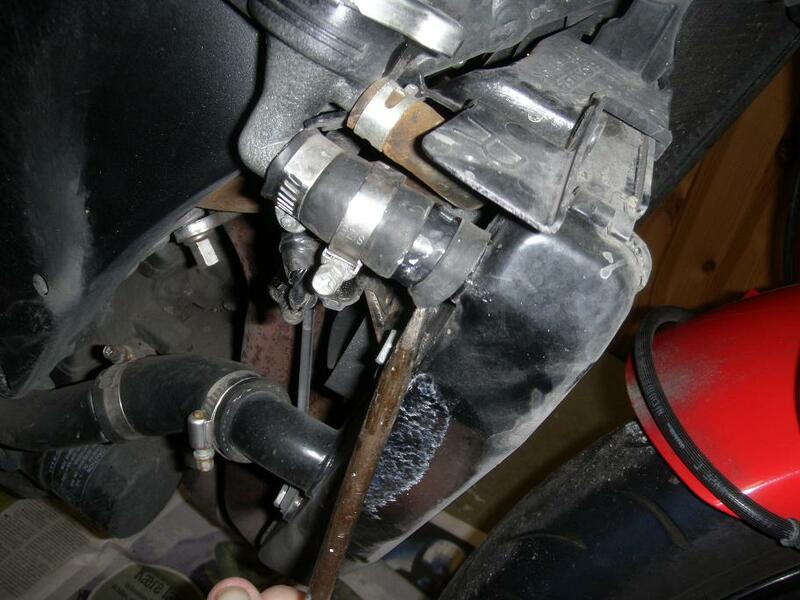 This is normall done as part of the valve clearance inspection and at the same time the coolant is replaced and the radiator is cleaned and bent fins due to stone hits are straightened. 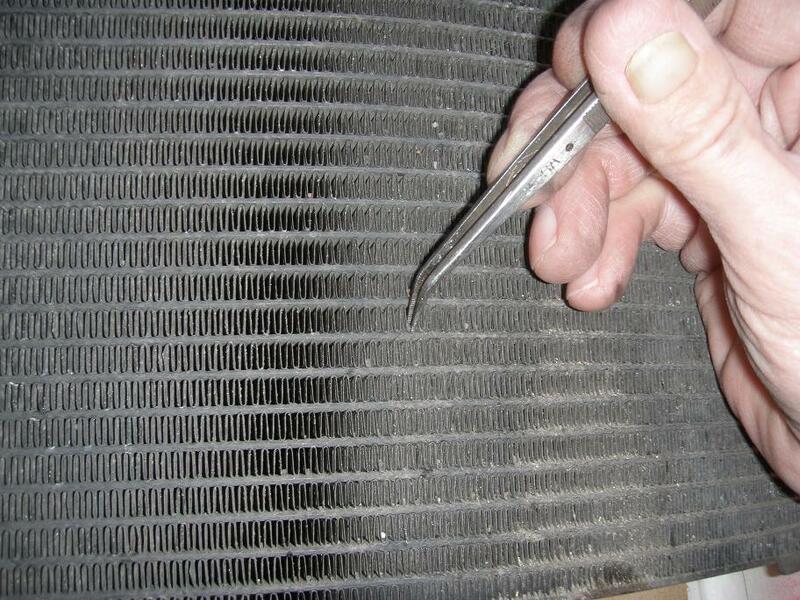 This is a DIY task which requires accuracy as you will be dismantling parts of the cooling system which operates at high temperature and high pressure. 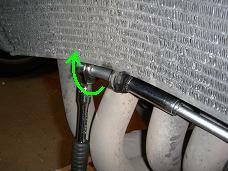 Failure may result in a leaking cooling system. 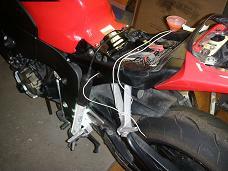 A first timer may spend 3-5 hours on it, an experienced may do it in 1-2 hours. 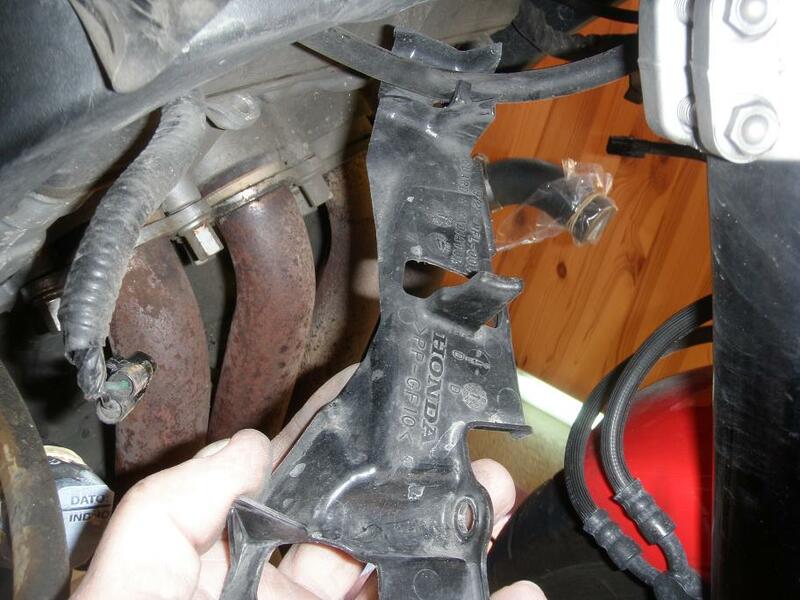 High quality ethylene glycol antifreeze containing corrosion protection inhibitors. I used Motorex Protect Ready which is ready for use as it is, without further dilution. 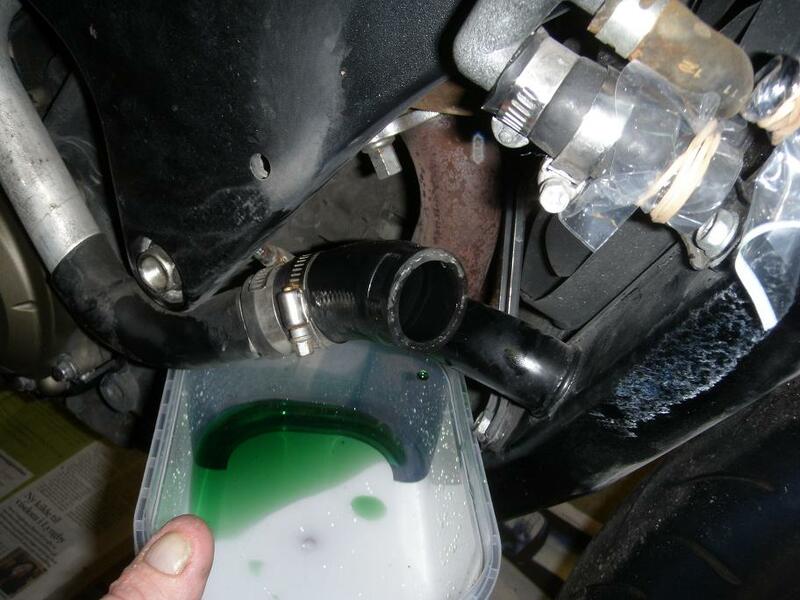 Important: The Honda Shop Manual warns against using coolants with silicate inhibitors as these may cause premature wear of water pump seals or blockage of radiator passages. Using tap water instead of distilled water may cause engine damage. 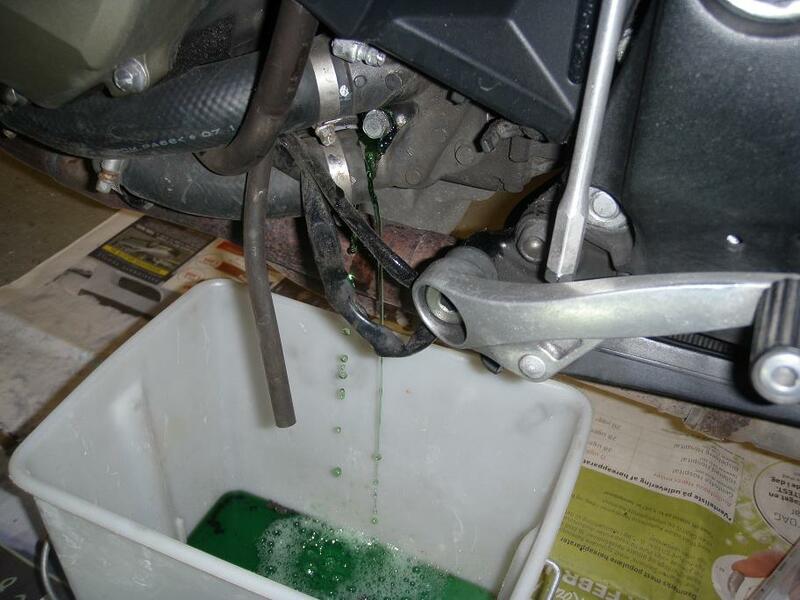 The easiest thing to do is to buy coolant specifically for bikes, and that is ready to use, i.e. already mixed. If you mix it yourself, be sure to use distilled water and the mix ratio must be 1:1. 1 Place the bike in upright position so you have easy access to both sides and to the front. 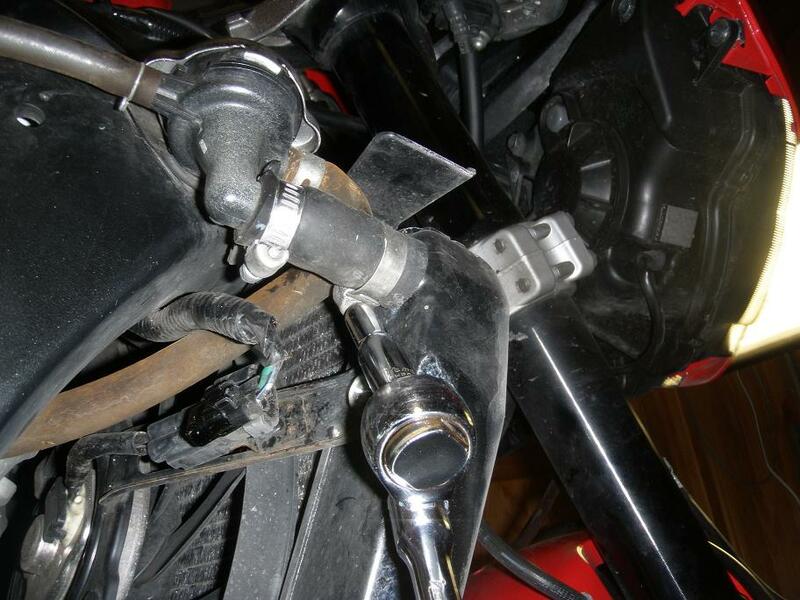 You may do the job using the side stand only, but upright is easier, and if you can lift the bike, that will be even better. 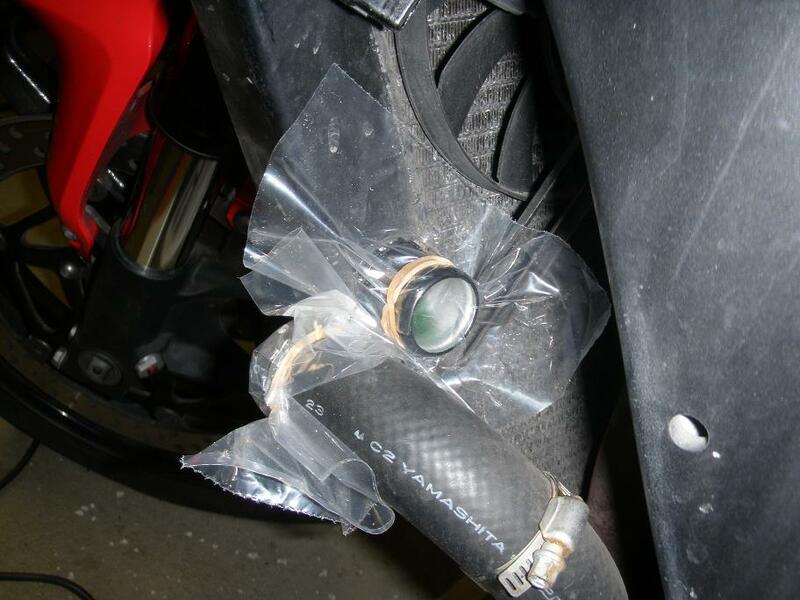 - Place a piece of red tape over the ignition key hole to remind you that the engine may not be started. Remove the radiator cap (below left and right). Warning: The engine temperature must be below 100 degrees C or you risk severe scalding by ejected steam and boiling water! 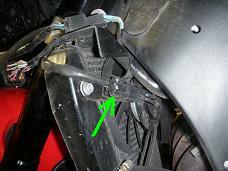 - Move the wires (green arrows, below left) off the plastic tabs (red arrows, below left) and downwards to get easy access. 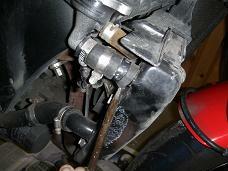 - Unscrew the drain plug and clean arround the hole. 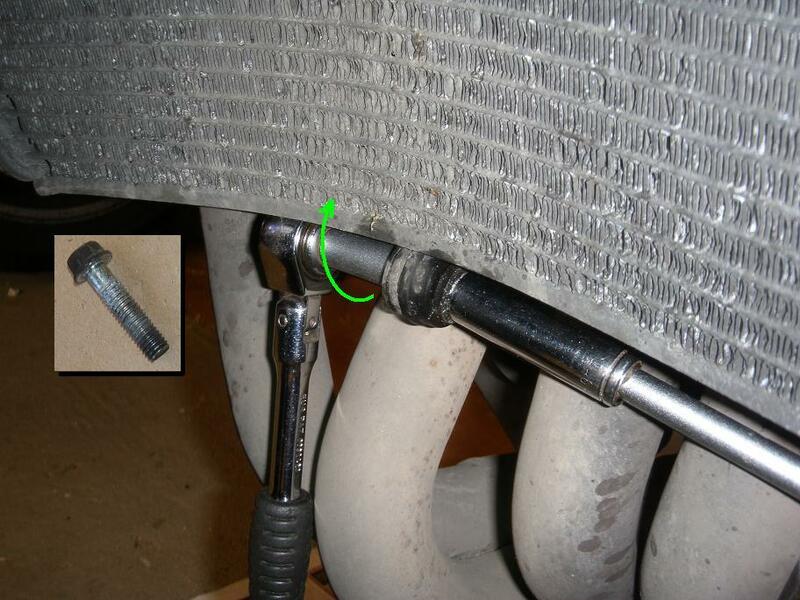 - Reinstall the drain plug 12 Nm (1.2 kgfm, 9 lbfft) using a new cobber sealing washer. - Disconnect the 2-pin black connector to the left fan motor (below left). Use e.g. 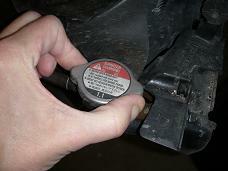 a screw driver to release the connector as shown (below middle). - Remove the trim clip holding the left heat guard plate onto the radiator (below right). 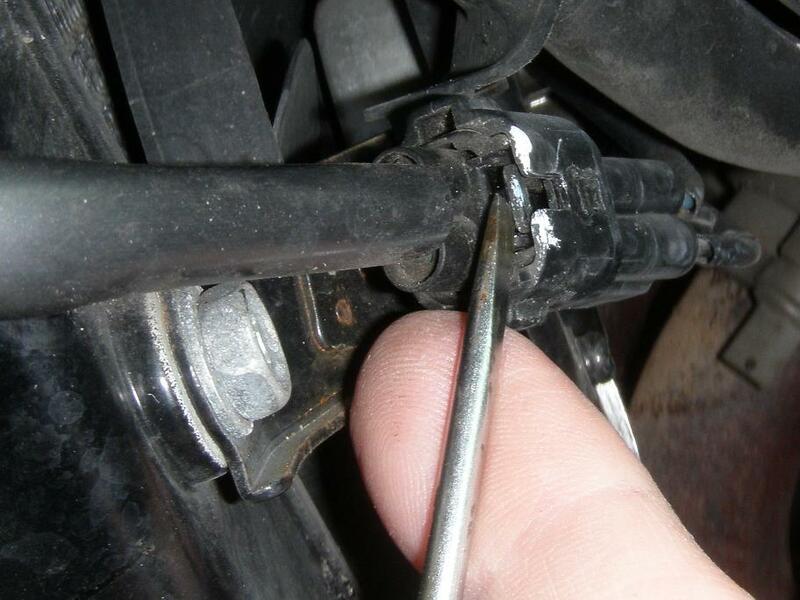 - Loosen the hose clamp screw and disconnect the left radiator hose (below left). 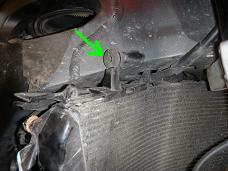 To keep dirt out and coolant inside, cover the holes using plastic and rubber bands (below middle). 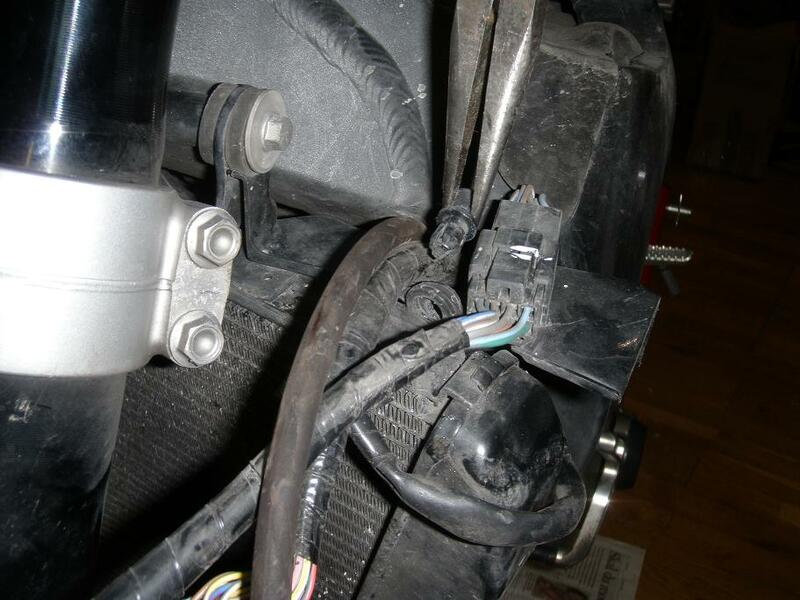 - Disconnect the 2-pin black connector to the right fan motor (below right). - Loosen the hose clamp screw on the front end of the water hose (below left). 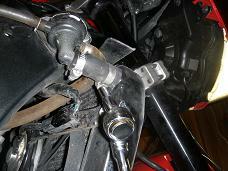 - Remove the trim clip holding the right heat guard plate onto the radiator (below middle). 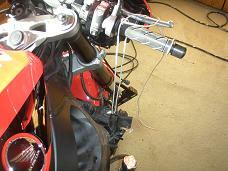 - Disconnect the water hose and cover the holes (below right). - Loosen the hose clamp screw on the right radiator hose (below left). 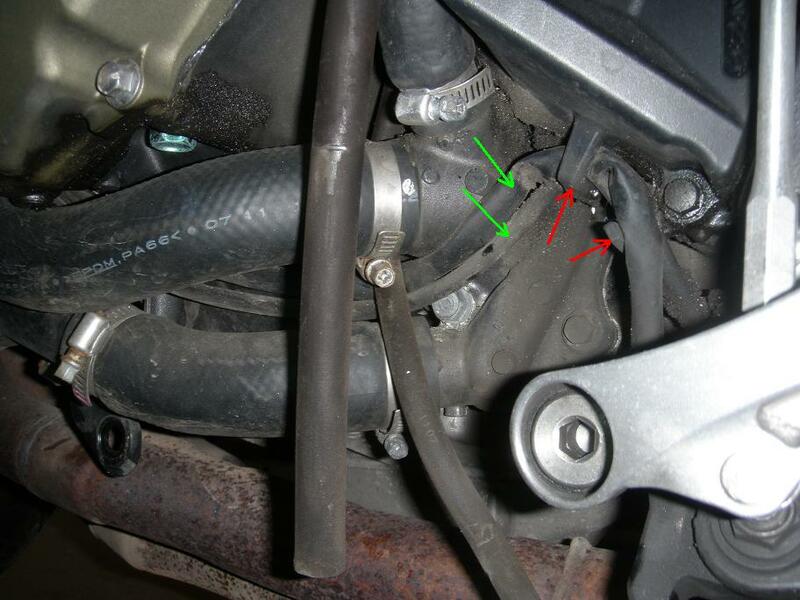 - Be ready for some coolant comming out when disconnecting the hose (below right). 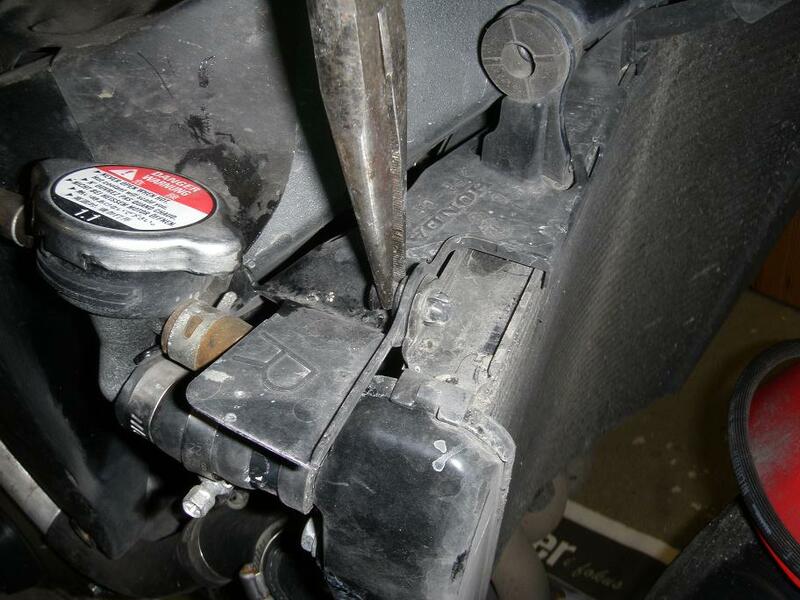 - Remove the bolt on the right side of the lower mount while holding contra on the left side (below left). 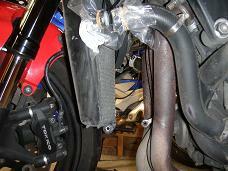 - Gently let the radiator hang down from the upper mounts (below middle). - Notice how the radiator hangs on the right side boss in a rubber grommet (below right). 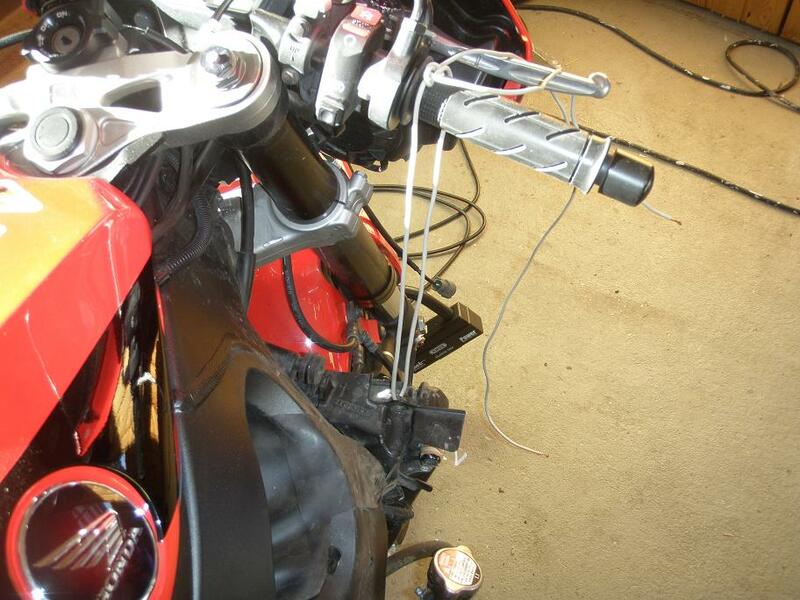 - Secure the right side of the radiator from falling down with a string. 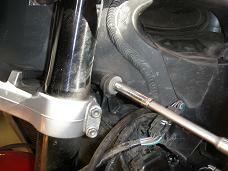 - Remove the left side bolt and washer, while holding the radiator so it does not fall down (below middle). 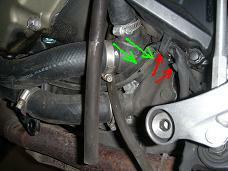 - Slide the radiator a little to the right and remove it from the bike (below right). 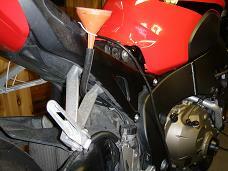 - Clean the radiator air passages with compressed air and/or water and straighten bent fins. 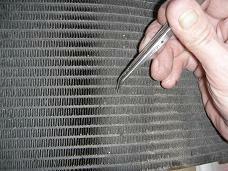 If more than 20 % of the radiator surface has been clogged or damaged it must be replaced. 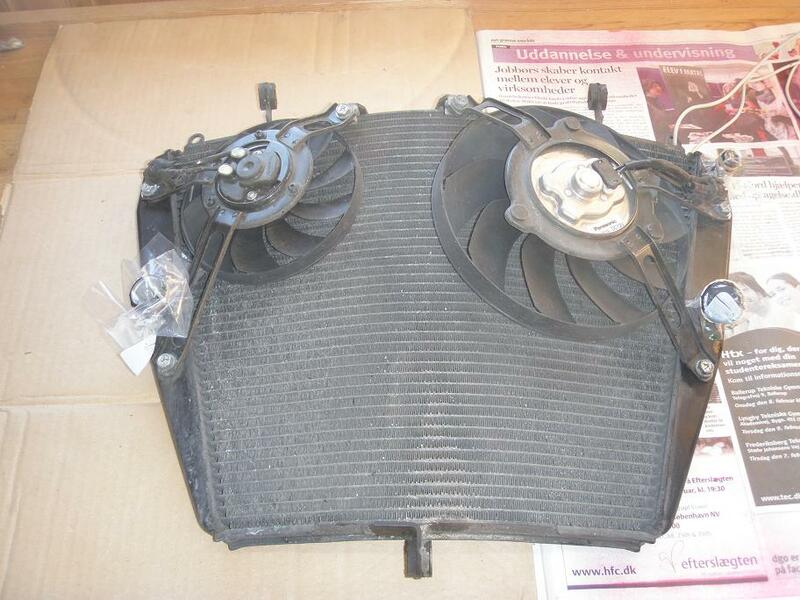 - The image below middle shows the engine with the radiator removed. 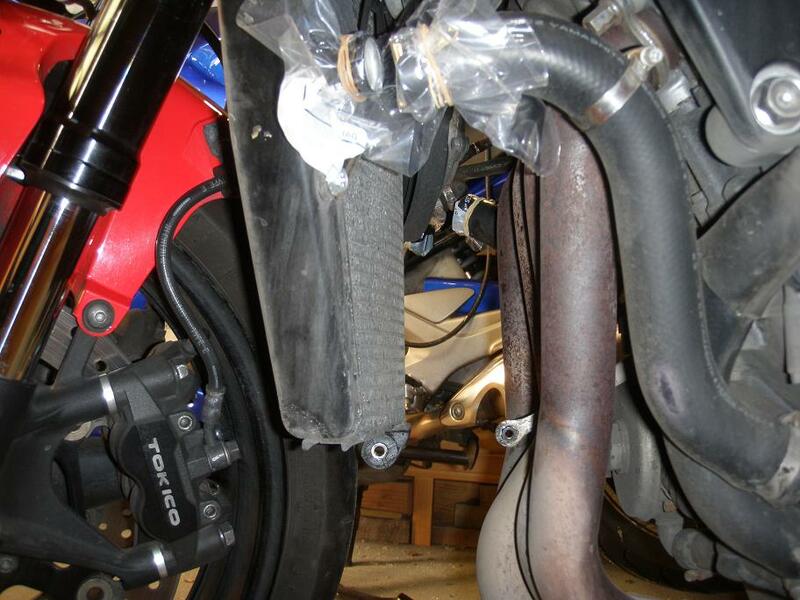 - Release the right heat guard plate from the clutch cable (below right). 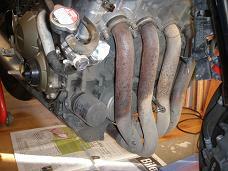 4.1 Install the radiator: See 3.3. and 3.2 above. Be sure to tighten the hose clamps sufficiently so they get tight. - The bike must be placed in an upright position. 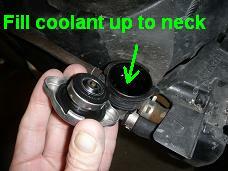 - Remove the radiator cap and fill coolant slowly to the filler neck (below left). Squeeze the radiator hoses a couple of times to release trapped air, refill as needed and reinstall the radiator cap. 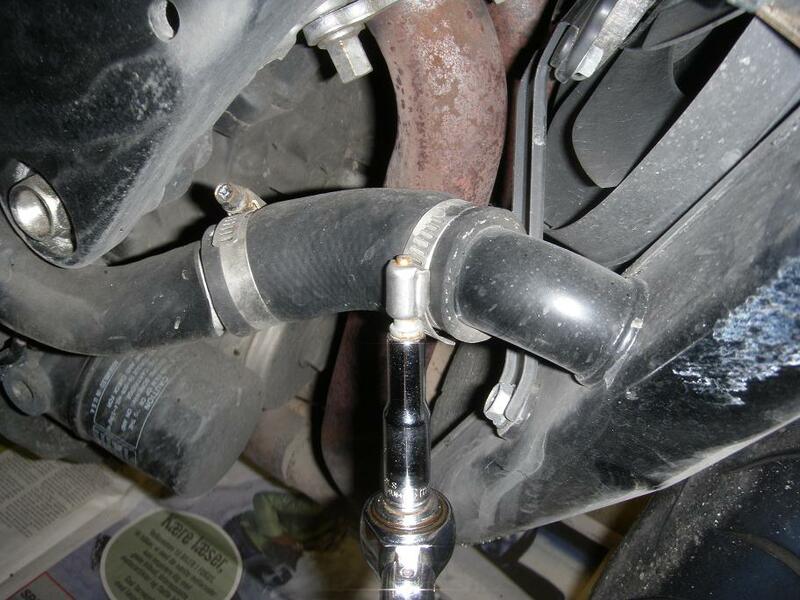 - Remove the radiator reserve tank cap, and using a funnel width 30 cm hose, fill up to the top marking (below middle, right and further down). Reinstall the cap. - Start the engine and let it idle for 2-3 minutes. 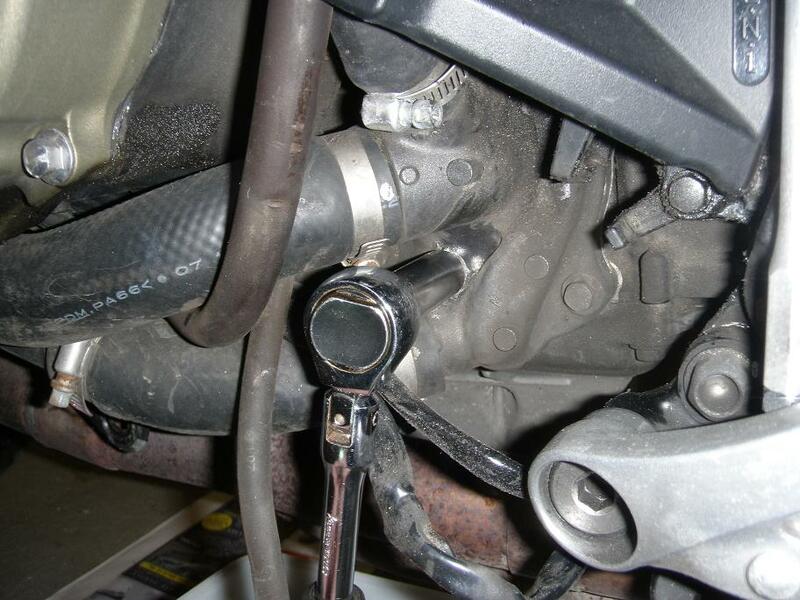 - Snap the throttle 3 to 5 times up to arround 5000 rpm to release trapped air bubbles. - Stop the engine and refill radiator and radiator reserve tank as needed (see step 4.2 above). Make sure the caps are correctly reinstalled. 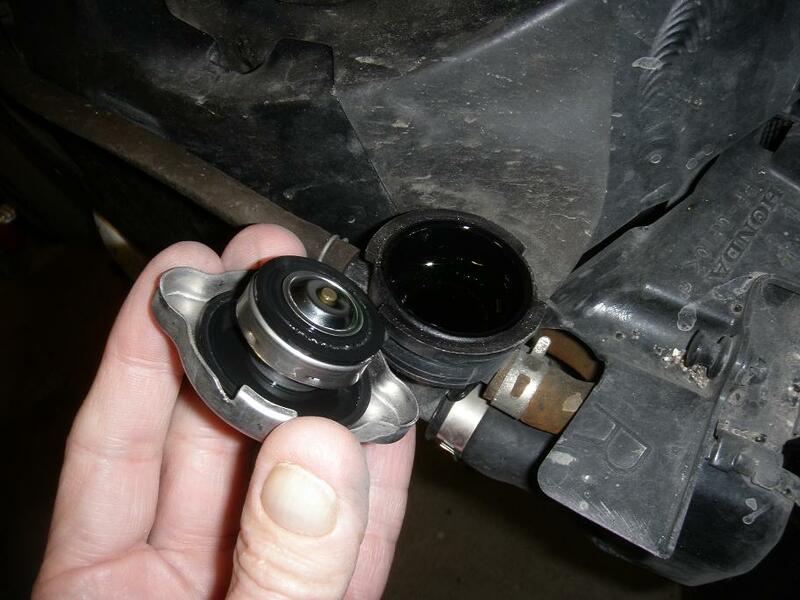 If you have the required tool, test that the radiator cap release pressure is in the range 108-137 kPa (1.1 - 1.4 kg/cm2, 16 - 20 psi). Also test that the radiator system is tight up to 110 kPa (do not exceed 137 kPa as this can damage the system). 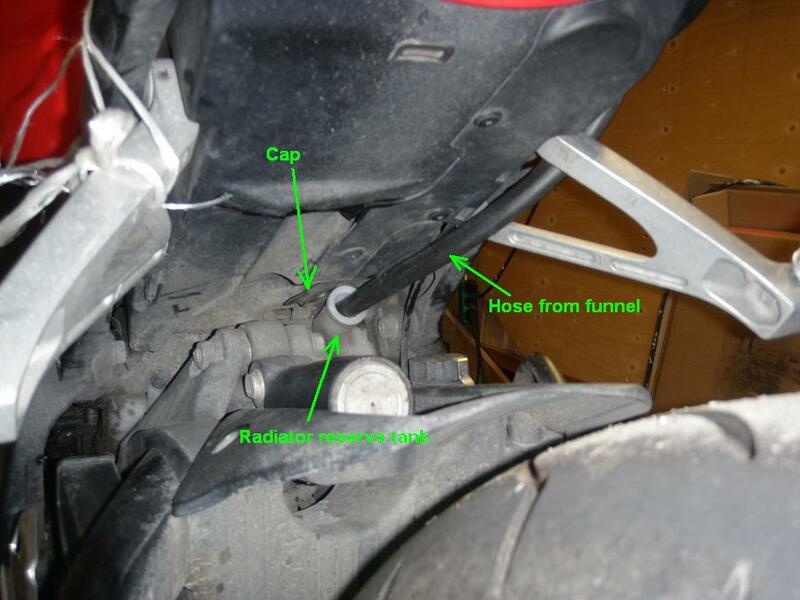 The Honda Shop Manual says that the system shall be able to hold the specified pressure for at least 6 seconds, but it does not actually tell what the specified pressure value is, and it does not define exactly what "hold for 6 seconds" means (if anyone knows more about this, please send me a mail about it). 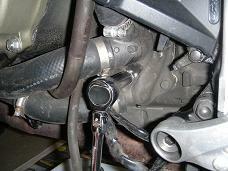 - Snap the throttle 3 to 5 times up to arround 5000 rpm. 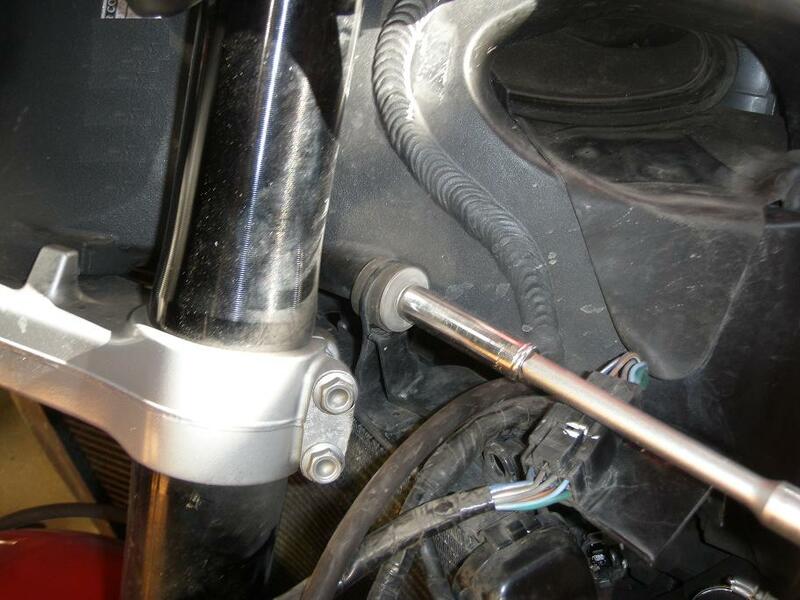 - Increase throttle up to 2-3000 rpm and watch as the temperature in the system rises, that the fan motors are started, first one and then the other as the engine gets hot. 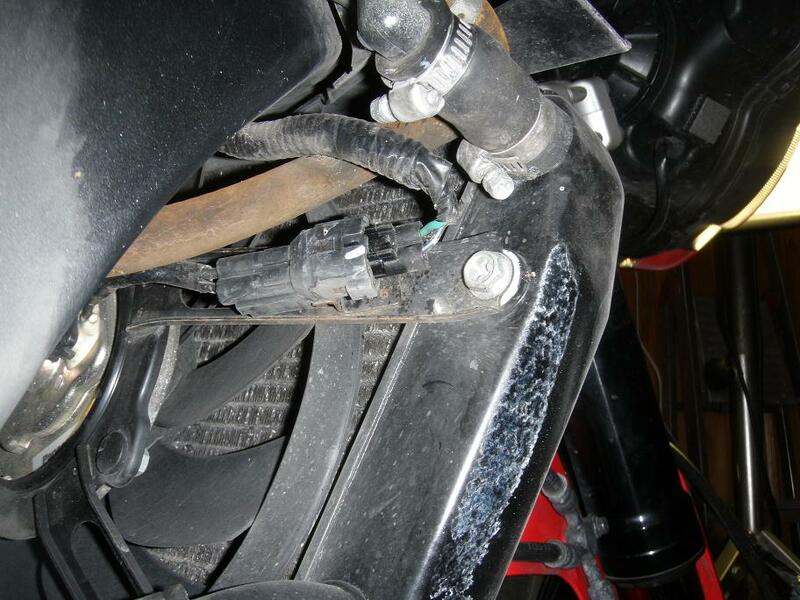 On my bike the temperature reached arround 105 degree C before this happened. 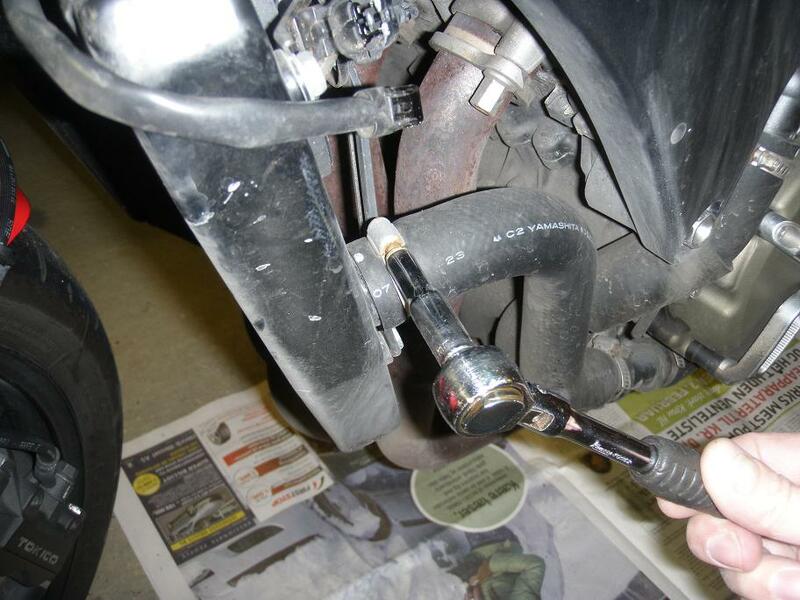 At that temperature the pressure in the cooling system is quite high, so this is the time where you must inspect all hose connections for possible coolant leaks. If you did not tighten the hose clamps sufficiently this may cause leaking.